In the heart of magnificent istrian peninsula you can enjoy this peaceful, luxury villa with swimming pool which provides all the comfort you need for your croatian holidays! Recently constructed and very tastefully decorated, idealy located, only 20 min (by car) from sea, historical sites and some really good tipical istrian restaurantes! 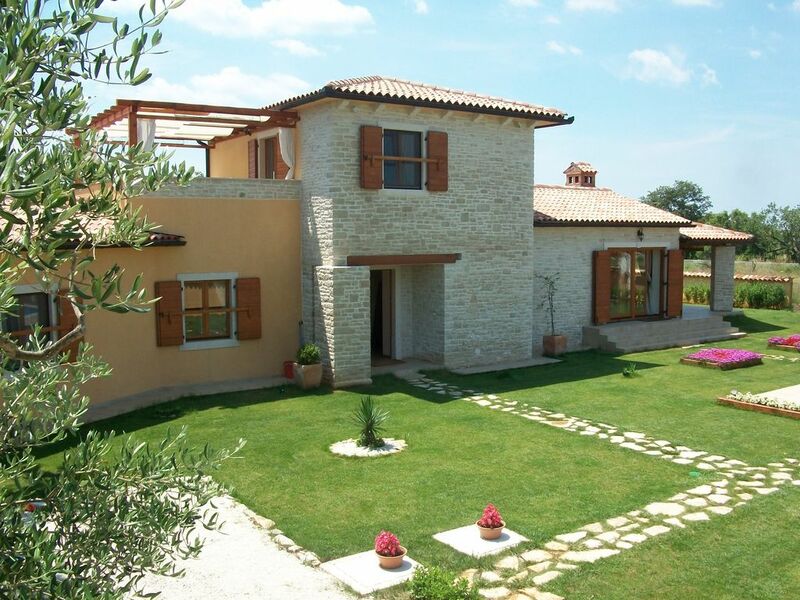 Very friendly owners call you to join their paradise among the beautiful olive trees! Welcome! CASA TIA is beautiful house! Very tastefully decorated and in a relaxing surrounding. The owners are amazing and ready to help if needed. It is a place where you can enjoy the privacy and silence of the country side from the swimming pool in front of the house and yet within minutes by car you could be sunbathing on the beach or swimming in the sea. The nature is stunning with the olive groves in front of the house. It is very well equipped. All in all it exceeded all of our expectations. We are definitely going back to this wonderful country house and we are planning on staying longer next time! we are so glad you enjoyed your short holidays in our house. Hope to see you again next summer! "The villa is very nice, clean, comfortable & is well equipped, owners very friendly and are ready to help in case you need something. we really enjoyed our stay. Thanks"
"Fantastic place to spend your holidays. our 3 boys loved the garden and the swimming pool! they could play all day. the house is very well equipped, including all little things such as lots of towels, toiletpaper, soap, stuff against insects, etc etc." "A great and peaceful holiday spent at CASA TIA!! It''s has been a sort of touch of Paridise where a person can re-charge its energy after having worked a lot! I will suggest CASA TIA to family, group of friends that love SEASIDE (just few minutes achieveable by car), COUNTRYSIDE (house is fully covered by olives trees), FOOD (Try and taste Vodjianka Restaurant in Vodnjan!) but would like to stay easily in contact with the world (WI-FI access available + satellite TV)." "Casa Tia is very easily accessible. It is close to the motorway (which gives a very easy access to the beautiful surrounding historical towns and villages) but it is very quiet. The surrounding is very beautiful and peaceful. The house is situated in the olive-tree orchard, on a quite a distance from another houses, which gives a lot of privacy. There is a beautiful view on the surrounding fields and from the upper terrass there is a view on the see, which is like 10km away. The house itself is clean and surprisingly more beautiful than on the pictures. It has a wonderful kitchen, which I really enjoyed, because I like cooking. The hosts are nice and helpful and one can see that they take pride in that. Due to two air-conditioners the house is cool, which was very pleasurable during a couple of hot days in August, especially during the night. The nights itself were magical, due to the quiet of the Istrian countryside. All in all, it exceeded our expectations in comfort, quiet and privacy." Wie immer fantastisch! Prädikat absolut empfehlenswert! Wir waren nun schon zum zweiten Mal Gast im Hause „ Casa Tia“ und fanden es noch besser als letzten Sommer! Das Haus ist äußerst liebevoll eingerichtet- einfach zum Wohlfühlen! Es fehlt an nichts! Wir sind mit unseren 4 Kindern dort gewesen, die den tollen Pool, das Volleyballfeld und die Hollywoodschaukel ausgiebig genossen haben. Zu betonen sind die äußerst netten Vermieter, Tamara und Alen, die immer sehr hilfsbereit und telefonisch erreichbar sind , falls man Fragen oder ein Problem haben sollte. Das wird nicht unser letzter Urlaub dort gewesen sein !